The multi-crore ‘Statue of Unity’ project is a ‘monument for the elite’ that has extracted a heavy price from poor tribals whose homes and land stand submerged. Prime Minister Narendra Modi’s unveiling of the “tallest statue in the world” has been accompanied by a high-voltage campaign on Sardar Patel’s contribution to nation-building. Of course, we know -- and Modi has made it repeatedly clear -- that this recognition of Patel is a part of the campaign to dismantle the legacy of Jawaharlal Nehru, the first Prime Minister of the country. In the game of opposing pairs of icons, sometimes it is Netaji Subhas Chandra Bose versus Nehru; sometimes, Babasaheb Ambedkar versus Nehru; and often, Patel versus Nehru. Nehru remains the constant enemy for Modi and the RSS-BJP. Why is Nehru the constant enemy? As Prime Minister, Nehru embodied the vision of the national movement: a secular state as the instrument of development for lifting Indian people out of poverty. This was the central impulse of the independence movement against the British. These two elements – secularism and development -- distinguish all the leaders of the national movement, whether Patel, Bose, Ambedkar, Nehru or others, from the Rashtriya Swayamsevak Sangh (RSS). For the RSS, the British were not the enemies; the nationalists, secularists and the Muslims were. The RSS is the only political formation that wanted an India based on religious identity; it had nothing to say about development either. For RSS, Indian and foreign capital should develop the Indian economy, with the state only playing the role of a facilitator. This is similar to what Modi has managed in the Rafale deal. It is such a vision of the state in the RSS ideology that kept the RSS and its allied movements out of the independence struggle. And this is why the secular institutions of the state and the public sector are seen as key enemies by the RSS-BJP today. These are the institutions that need to be dismantled, along with Jawaharlal Nehru. The “Unity” Statue of Patel has been built at a cost of Rs 2,989 crore. As Dhirubhai Patel, the 91-year-old grandnephew of Sardar Patel, has said, Patel would not have approved of this statue. He knew the value of money. Sardar Patel has been often quoted on his priorities for India: “I have one wish: that India becomes a productive nation; no one should cry for food and remain hungry.” Patel would certainly not have approved of wasting Rs 2,989 crore on a statue which will produce nothing but dubious vainglory for Prime Minister Modi. A number of people have made calculations to list more productive uses of this amount of money. Or with the money our most travelled PM has spent on his frequent foreign tours. Prime ministers are “allowed” their vanity expenditures. We pay a much higher price when we procure Rafale aircraft at eight billion euros, and that too without any technology transfers, and indigenous development. And we might have to “compensate” the US now for daring to buy Russian S-400 missile defence systems, by procuring US made, outmoded F16s at an even higher price. So, perhaps, we should overlook the “small” price tag of about $400 million for the 182-metre, world’s tallest statue! 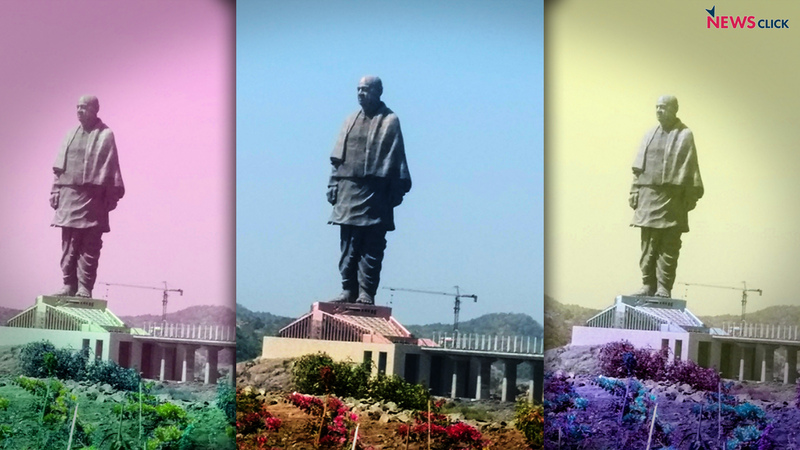 Further, “A heavy-load open lift with a panoramic view will be built alongside the Statue of Unity. Visitors will be able to rise up within statue, walk into a viewing gallery and enjoy a panoramic view of the Sardar Sarovar project and the surrounding region from an astounding height of close to 400ft.” In other words, this statue is a monument to the Indian elite, who can come, look at a beautiful lake, rise without any effort to a height of 400 feet and have a panoramic view of the surroundings. It is about elite “consumption” of nature. You know what you don’t see from 400 feet? People. Nor do we see them when you look at the lake that has submerged 377 square kilometres of land. What is missing in this picture of development? The people who have paid for the statue and the lake that has submerged their homes and lands. The people Patel talked about when he envisioned a productive nation. It is always true that the poorest pay the most in development projects involving dams and mines. Their lands are taken away, the compensation is either not given, or meagre; they have no alternative livelihood. The gains are for capital, who make money out of the projects, then enjoy the continued benefits. The landed peasantry and big landowners benefit from the irrigation provided downstream. Even the electricity from the power house of hydro-electric projects do not reach the villages nearby, only towns and industries far away. This is how capital views development and that is how it operates under capitalism. The Narmada Dams – Sardar Sarovar and Indira Sagar -- are no different. The tribal villages that have been displaced for the dams, are yet to receive water or electricity; the affected people their full compensation. The villagers near Sardar Sarovar say that 28 villages near the Sardar Sarovar Dam are yet to receive water. 72 tribal villages kept a day’s fast on October 31, the day Modi inaugurated the statue. There have been widespread protests by the tribals in the area. Posters of Modi and Rupani have been blackened, requiring police protection for posters! The “Unity” Statue has fared no better. The heads of 22 villages wrote an open letter to the PM, saying that they would not welcome him for the inauguration. They wrote, “These forests, rivers, waterfalls, land and agriculture supported us for generations. We survived on them. But, everything is being destroyed now and celebrations are also planned. Don’t you think it’s akin to celebrating someone’s death? We feel so.” So much for Modi’s unity. It also appears that there were other issues with the statue project. The relevant environmental clearances were not taken, nor the villagers consulted, as the law requires for such projects. Modi’s statue project brings to mind the relationship between monumental architecture and the fascist imagination. From ancient rulers to modern “strongmen”, they all seem to be fascinated by size. And let us also understand Patel’s attraction for Modi: if Patel was the Iron Man of 20th century India, Modi wants to be his 21st century version. This is as much statue of himself as it is of Patel’s. Statues rise and fall, Mr. Modi, only the people remain.